There are currently 8 Shetland Sheepdogs being trialled in Western Australia in both Agility and Obedience. We would love to see more Shelties out there giving it a go. 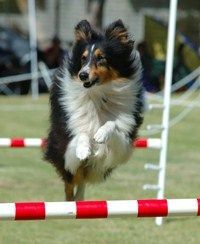 The world of agility in Australia is currently dominated by Border Collies but Shelties are stepping up to the plate and putting their stamp on this relatively new performance sport. So what is agility? First let me say it is awesome fun for you and your dog. This sport was first seen at Crufts in London, England, in 1978 and wasn’t introduced to Australia until about 1983 in NSW. Agility didn’t catch on in WA until around 1988. Run in three different levels, Novice, Excellent and Masters, a course of jumps and obstacles are set up by a judge, appropriate to your level. The dog is required to negotiate them in numbered order, without making an error in the required time limit. Just when you think you have that worked out, they also have an open class which requires you to do a distance handling element during the course. This means you must direct your dog over the obstacles from a distance determined by the judge. As the name suggests, Obedience requires focus and precision from your dog as he is going through his paces. It starts at a basic level of CCD (Community Companion Dog) all the way through to the more complicated excercises of UDX (Utility Dog Excellent). There are a wide variety different exercises you can do with your dog ranging from the basic sit to retrieving a dumb bell or finding a scented article. Shelites are well suited to this discipline as they have a great desire to work and want to please their handlers, so why not give it a try. To find out more about the exciting sports of Agility or Obedience please contact either Dogs West or your local dog club.